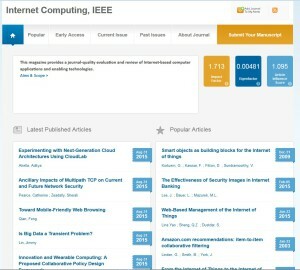 Two articles on Internet of Things (IoT) published by CDIT researchers in 2015 are among the top 50 most downloaded publications (ranked 3 and 38 respectively) in the prestigious IEEE Internet Computing. No 3: Web-based Management of Internet of Things, Lina Yao, Quan Z. Sheng, and Schahram Dustdar. IEEE Internet Computing, Vol 19, No 4, pp 60-67, July/August, 2015. The Internet of Things (IoT) is an emerging paradigm where physical objects are connected and communicate over the Web. The IoT system presented here seamlessly integrates virtual and physical worlds to efficiently manage things of interest (TOIs), where services and resources offered by things easily can be monitored, visualized, and aggregated for value-added services by users. Using practical experience gained from this system, the authors identify several R&D opportunities for building future IoT applications. No 38: Matching over Linked Data Streams in the Internet of Things, Yongrui Qin, Quan Z. Sheng, and Edward Curry. 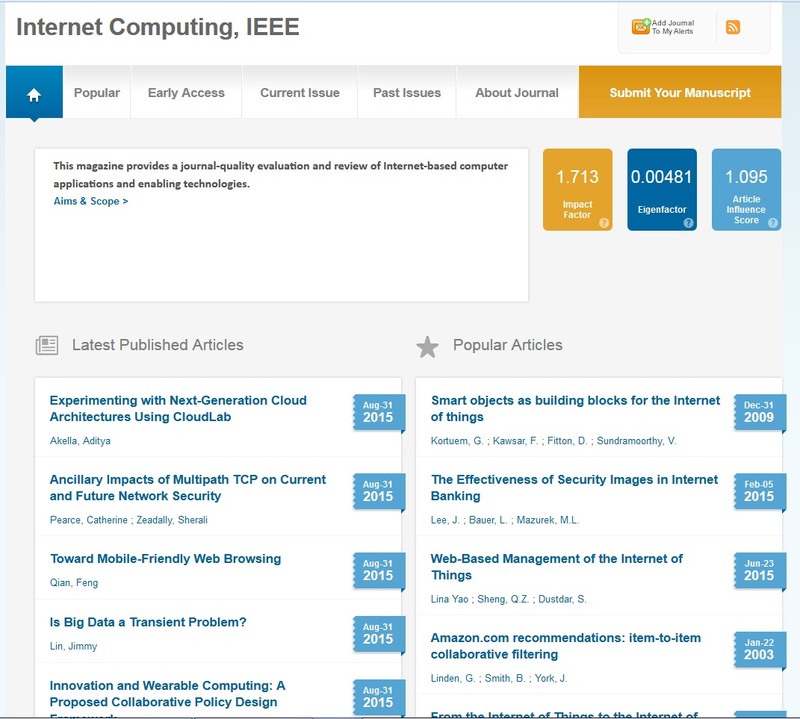 IEEE Internet Computing, Vol 19 No 3, pp 21-27, May/June 2015. The Internet of Things (IoT) envisions smart objects collecting and sharing data at a global scale via the Internet. One challenging issue is how to disseminate data to relevant data consumers efficiently. This article leverages semantic technologies, such as Linked Data, which can facilitate machine-to-machine communications to build an efficient stream dissemination system for Semantic IoT. The system integrates Linked Data streams generated from various data collectors and disseminates matched data to relevant data consumers based on user queries registered in the system. Here, the authors present a new data structure, TP-automata, designed to suit the high-performance needs of Linked Data stream dissemination. They evaluate the system using a real-world dataset generated in a Smart Building IoT Project. The proposed system can disseminate Linked Data streams at one million triples per second with 100,000 registered user queries, which is several orders of magnitude faster than existing techniques.